NCDs will affect U.S. interests because of their human, economic, and strategic consequences. "More patients will get sick, suffer longer, require more medical care, and die young. Given the scale of these trends, the results will reverberate," the Task Force warns. It is projected that the NCD epidemic will inflict $21.3 trillion in losses in developing countries over the next two decades—a cost nearly equal to the entire economic output of those countries in 2013. "These economic consequences will undercut potential U.S. trade partners and allies and may reduce domestic support for governments of U.S. strategic interest." The Task Force says the United States and like-minded partners can help developing countries meet the NCD challenge at relatively modest cost and "slow the rise of this epidemic, lessen its worst effects, and help provide national governments with the time and technical assistance needed to tackle this emerging crisis sustainably on their own." The U.S. government should take two immediate steps, the Task Force says: examine its global health priorities and spending and ensure their continued effectiveness; and convene governments and other potential partners from around the world to develop a plan for collective action on NCDs in low- and middle-income countries. In the short term U.S. leadership would have a significant effect on cardiovascular disease, tobacco control, liver cancer, and cervical cancer. "Low-cost, prevention-based solutions exist for each challenge and the United States is in the position to help local governments implement them." In the medium term U.S. leadership would make a tremendous difference to address diabetes and treatable and curable cancers, such as leukemia and breast cancer. 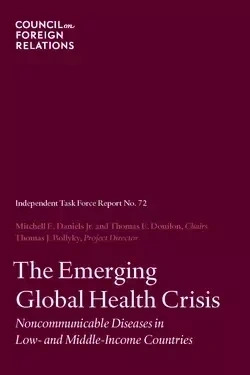 "The Task Force has identified several NCD challenges for which effective interventions are widely used in the United States and other high-income countries, but not yet sufficiently low cost or usable in low-infrastructure settings . . .With U.S. leadership, more population and implementation research, and collaboration with private sector and philanthropic partners, progress on adapting these interventions for cost-effective, low-infrastructure use is foreseeable in the near term." U.S. collaboration with developing countries and the private sector may help ameliorate poor diets and nutrition, physical inactivity, and obesity. It could also help integrate mental health into primary care and provide low-cost chronic care programs and technologies. "There is no long-term treatment solution to the challenge of NCDs. Only prevention can reduce the burden of these diseases and lower their associated health-care costs to sustainable levels. This is true in the United States, but particularly so for developing countries with limited resources." Read the Task Force report, The Emerging Global Health Crisis: Noncommunicable Diseases in Low- and Middle-Income Countries. See also an annex with research methodology and profiles of nearly fifty priority countries. Explore the online interactive based on the Task Force. Read the accompanying op-ed by Mitchell E. Daniels Jr., Thomas E. Donilon, and Thomas J. Bollyky. This project is made possible in part through generous support from Bloomberg Philanthropies.